The construction of new apartments which has underpinned Canberra’s building activity in recent years is forecast to fall for the next two years, according to the ACT’s latest housing report card. However, in contrast to the national picture, the ACT’s building market is expected to remain solid, with construction of detached housing predicted grow strongly and home renovations forecast to make a comeback. The predictions are contained in the Autumn 2017 Outlook Report for the Australian Capital Territory released by the Housing Industry Association (HIA), which represents the residential building industry. “The construction of new apartments has underpinned building activity in the ACT over recent years and has driven a doubling of new multi-unit commencements towards the end of 2016,” said HIA Executive Director for ACT and Southern NSW, Greg Weller. Mr Weller said the star of the latest forecast is detached housing commencements which experienced 42.5 per cent growth during the 2016/17 financial year, even though this was from a low base. “Growth in this sector will see detached homes elevated to near levels not seen since 2009/10, and rebalance single dwellings more with multi-units,” Mr Weller said. Mr Weller expects ACT home building statistics to remain solid in coming years. “The ACT building market is forecast to remain strong off the back of a stable economy and significant investment in infrastructure,” he said. In terms of the national market, the HIA is forecasting a decline in new home building following record levels in 2016. The national report forecasts that last year’s record levels of activity are unlikely to be seen again until well into the 2020s. “The housing boom was not consistent across Australia and now with NSW and Victoria cooling, all indicators are that the market is well past its 2016 peak when over 231,000 new homes were commenced,” HIA Senior Economist, Shane Garrett said. “Solid population growth, very low interest rates and consistent gains in employment do mask some concerning trends with respect to under-employment and decelerating GDP growth,” he said. HIA’s National and State/Territory Outlooks provide forecasts of new dwelling construction volumes and renovations activity, as well as policy updates and analysis of economic issues. 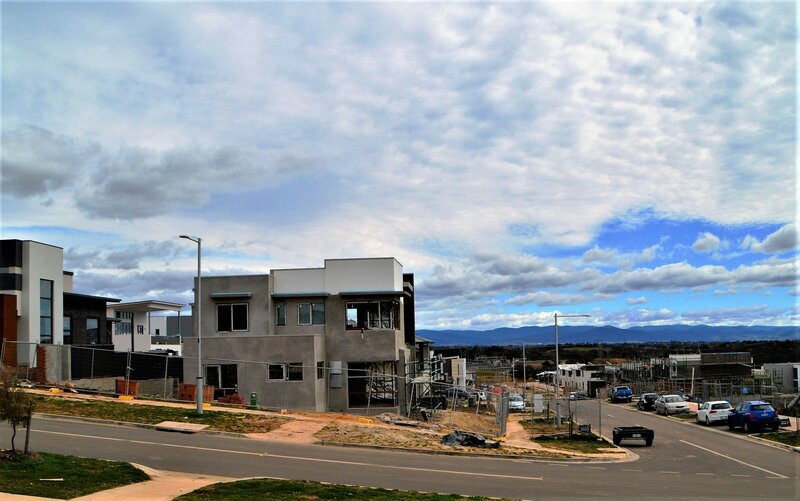 Photo: New home building in the new North Canberra suburb of Lawson. Photo by Glynis Quinlan.